Through its sponsorship of the British Museum, oil giant BP enjoyed significant influence over major exhibitions on Australian and Mexican culture – at a time when the company was pursuing commercial deals in both countries. Emails sent by staff at the two organisations reveal that the oil company sought access to Mexican and UK government figures at a private event held by the British Museum as part of last year’s BP-sponsored Days of the Dead festival, just one month before bidding opened for new deepwater drilling permits controlled by the Mexican government. The heavily redacted documents – obtained via a freedom of information request (FOI) submitted by campaign coalition Art Not Oil – reveal how BP has been colouring outside the lines in its commercial relationships with the British Museum, Tate, the National Portrait Gallery and the Science Museum. The emails reveal that BP was consulted on curatorial decisions, including acquisitions of artworks, for major exhibitions held last year at the British Museum, each of which held strategic political and commercial value for BP. The Days of the Dead festival took place as BP was preparing to bid for fresh offshore drilling licenses in the Gulf of Mexico – five years after the Deepwater Horizon oil spill decimated the gulf. The museum’s Indigenous Australia: Enduring Civilisation exhibition, also sponsored by BP, took place when the company was seeking to drill for offshore oil in the Great Australian Bight, an ongoing process that has proved unpopular with the Australian public. Art Not Oil report that in both instances, BP staff gained direct access to policy-makers from Mexico and Australia through their involvement with these two exhibitions. The emails also reveal that BP used its position as sponsor to influence the Science Museum’s choice of launch date for last year’s Cosmonauts exhibition, in order both to maximise BP’s access to senior Russian officials and to avoid a clash with the US courts announcing the outcome of the Deepwater Horizon trials. BP has a 19.8% stake in Russian state oil company Rosneft, making it the largest shareholder after the Russian government. Read Art Not Oil’s full report here. In 2011, BP signed a five-year sponsorship deal with the British Museum, the Royal Opera House, Tate and the National Portrait Gallery. Earlier this year, BP confirmed that it would not be renewing its partnership with Tate. The remaining three institutions are still in negotiations with BP. Sponsorship deals between cultural institutions and oil giants have long been criticised by campaigners as means for the latter to buy ‘social license to operate’, promoting an image of corporate responsibility to mitigate reputational damage from environmental destruction and contribution to climate change. These documents reveal some of the ways BP has directly benefited from arts sponsorship, and the specific ways in which museum practices have been affected. 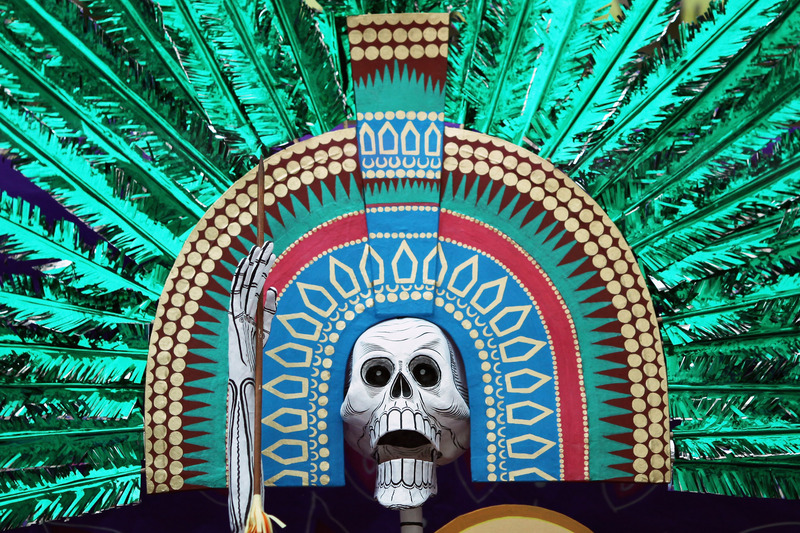 The report found that BP’s sponsorship of the Days of the Dead festival was not included in its five-year deal with the British Museum. Funding was offered as an extra at short notice, just as a fresh round of deepwater drilling licenses in the Gulf of Mexico were about to be made available. According to Art Not Oil’s Chris Garrard, this sudden supply of funding “looks like an obvious tactical move to improve [BP]’s chances”. When the British Museum’s head of events sent the guest list to the Mexican embassy, they requested that it be deleted after reading. The report points out that BP has embraced Mexico’s Energy Reform Act of 2013, a controversial bill that encourages foreign and private companies to extract and transport oil using favourable tax conditions and royalties. BP has already secured one contract for shallow drilling in Mexico, but the company has its sights set on more lucrative deepwater contracts controlled by the Mexican government – bidding for which began one month after the Days of the Dead festival and continues throughout 2016. Neither the current nor the previous Mexican governments have held BP to account for 2010’s Deepwater Horizon oil spill, according to Art Not Oil. The museum briefing recommended BP answer such questions with an itemisation of its relationship with the museum so far. It made no mention of ethics or BP’s environmental track record. Art Not Oil also noted that the majority of Aboriginal communities involved in the exhibition were not informed that BP was a sponsor, a perhaps insensitive move given the well-documented impacts of extractive industries on Indigenous peoples, and given the ongoing struggle between BP and traditional land owners over controversial plans to drill for oil in the Great Australian Bight. The Museum Association’s code of ethics has also potentially been breached, and the association’s ethics committee has just opened an investigation into the claims made by Art Not Oil that museums have been bending to the will of a corporate sponsor. As part of Art Not Oil’s investigation, evidence emerged suggesting that several of the museums in question may have withheld requested information, which would place them in breach of the Freedom of Information Act. Tate has already been forced to release withheld data on BP funding following an information tribunal in 2015.